Drills, NDT & NDI Equipment including Ultrasonic, Phased Array & Eddy Current Array Systems. Leading Edge Flaps on Northrop F-5 are subjected to extensive wear and corrosion. Costs for replacing complete aero-structures are excessive and deliver times are impractical. 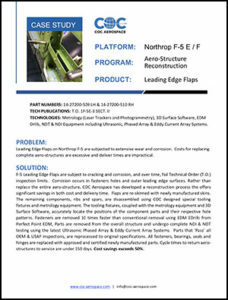 F-5 Leading Edge Flaps are subject to cracking and corrosion, and over time, fail Technical Order (T.O.) inspection limits. Corrosion occurs in fasteners holes and outer leading edge surfaces. 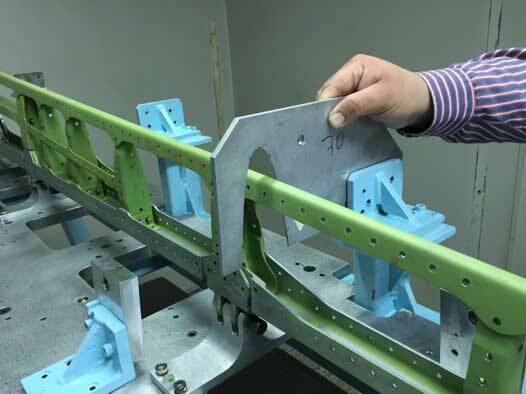 Rather than replace the entire aero-structure, COC Aerospace has developed a reconstruction process the offers significant savings in both cost and delivery time. Flaps are re-skinned with newly manufactured skins. The remaining components, ribs and spars, are disassembled using COC designed special tooling fixtures and metrology equipment. The tooling fixtures, coupled with the metrology equipment and 3D Surface Software, accurately locate the positions of the component parts and their respective hole patterns. Fasteners are removed 10 times faster than conventional removal using EDM EDrills from Perfect Point EDM, Parts are removed from the overall structure and undergo complete NDI & NDT testing using the latest Ultrasonic Phased Array & Eddy Current Array Systems. Parts that ‘Pass’ all OEM & USAF inspections, are reprocessed to original specifications. All fasteners, bearings, seals and hinges are replaced with approved and certified newly manufactured parts. Cycle times to return aerostructures to service are under 150 days. Cost savings exceeds 50%.